AlgoRun is a docker-based software container template designed to package computational algorithms. These pages show steps of how to create an AlgoRun container of your implemented algorithm. Don’t forget to use docker pull algorun/algorun before you start packaging algorithms, in order to get the latest update of AlgoRun Docker image. A Dockerfile is a text document that contains all commands needed to build the software container. Docker builds a software container automatically by reading the instructions from the Dockerfile. AlgoRun template container uses the src and algorun_info folders to deposit all your source code and to describe the implemented algorithm in a standard format. 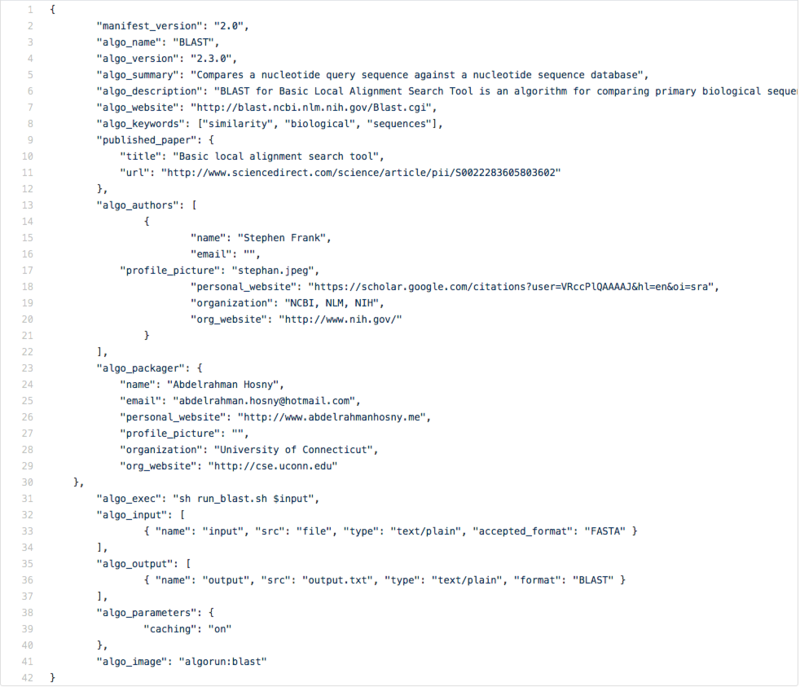 STEP 3: Edit the manifest.json file inside the algorun_info folder. Below is an example of the manifest file. “algo_exec”: is the command used to start algorithm executed. “algo_input”: is how the algorithm reads the input data. “algo_output”: is the path of the file where the algorithm outputs its result or stdout if the algorithm prints the result to the standard output stream. Command line options can be exposed in the “algo_parameters” field (Refer to examples tab for a detailed example using parameters). AlgoRun website uses “input_type” and “output_type” to easily identify algorithms that can communicate together. Please refer to http://algorun.org/input-output-types to see what input and output types you should use. Users can also download and use the algorithm Docker image locally from Docker Hub if the value “algo_image” is provided. STEP 4: Provide input and output examples in the input_example and output_example folders respectively. STEP 5: Build the algorithm container from the command line using docker build command: docker build -t <algorithm_name> . Now that the algorithm container has been deployed on your local machine (localhost), AlgoRun provides the user with three different ways to run the algorithm. The web user interface of an algorithm packaged with AlgoRun. 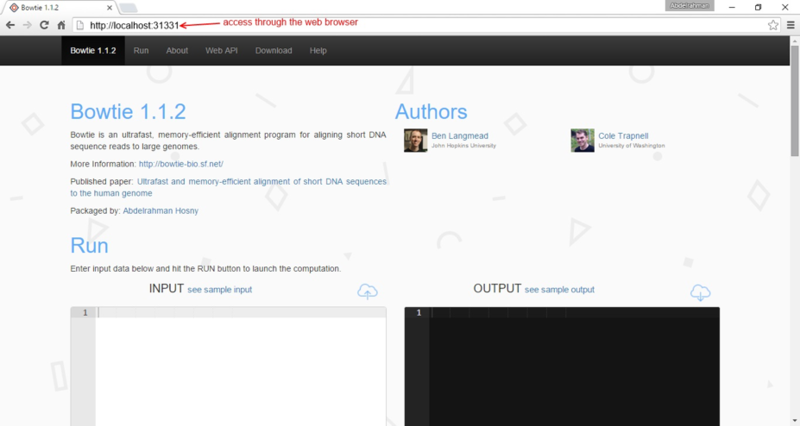 Type in the address http://localhost:31331 in a web browser to open the web page of the running algorithm container. A web API is an Application Programming Interface (API) used to offer programmatic access to remote resources or services (in our case “computations from an algorithm”) that can be accessed by clients such as web browsers or any http-enabled third-party applications. AlgoRun containers are pre-included with a RESTful API  that allows access to the computation through the traditional HTTP POST request. Clients communicate to web APIs through a request/response protocol. To ask the web service to perform a computation, a client sends an HTTP request. The body of the request includes necessary input data for the algorithm behind the web service to start. The response of the web service includes the result of the computation. AlgoRun Web API Communication Scheme. 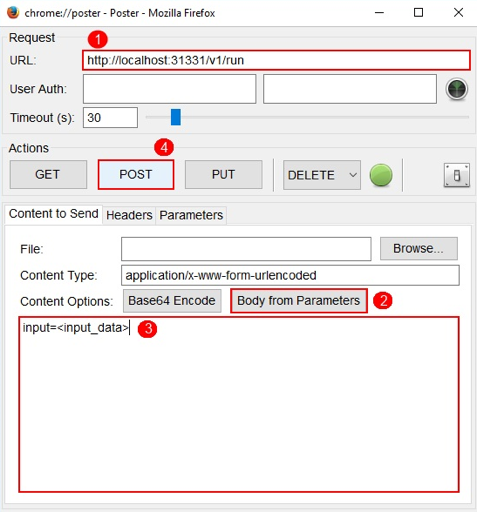 The HTTP request should be sent to a specific address, which is called an endpoint. The two main endpoints exposed by AlgoRun containers are shown below. By offering standardized input and output, Web APIs are particularly useful when it comes to building complex software applications as they make it easy to integrate different algorithms that usually run on different programming environments. It enhances the modularity of the software, hence increases its robustness and makes troubleshooting problems easier. You can embed computations in large software programs in just a few lines of code, removing the hassle of installing the whole algorithm environment locally. To test a web API, Firefox Poster Plugin is a graphical user interface tool used to easily send and troubleshoot HTTP requests. See below for examples on using the above AlgoRun endpoints. 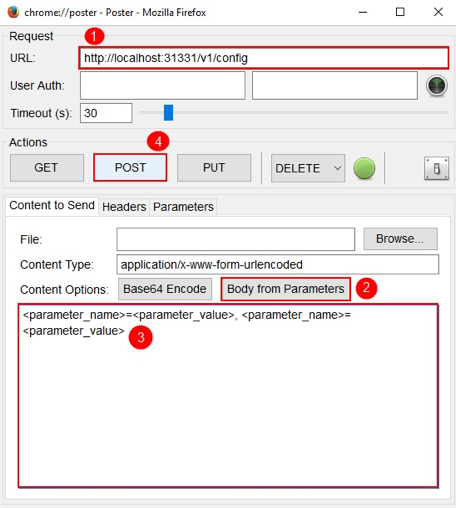 Configuring Parameters using Web API: (1) Type the URL of the endpoint http://localhost:31331/v1/config (2) Select Body from Parameters. (3) Type <parameter_name>=<parameter_value>. (4) Click Post to initiate the request. The traditional command line execution is still available as well. REpresentational State Transfer (REST) APIs uses Hyper Text Transfer Protocol (HTTP) requests as the main scheme of communication. Packaged Algorithms with AlgoRun before?